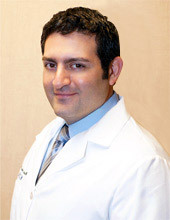 Dr. George was born and raised in the Metro Detroit area and grew up in Southfield, Michigan. He attended Brother Rice High School and furthered his studies at Wayne State University earning a Bachelors of Science in Biology. He continued on to medical school at Michigan State University College of Osteopathic Medicine and through his medical rotations became interested in anesthesiology. His anesthesiology residency was through Wayne State University/Detroit Medical Center and there he was exposed to the practice of pain medicine where he experienced the rewarding work of helping alleviate patients suffering while helping them to resume active lifestyles. His post doctoral fellowship in pain medicine was completed at the University of Michigan in Ann Arbor which offered him tremendous exposure to a multitude of pain pathologies along with offering excellent clinical experience. Dr George currently practices both anesthesiology and pain medicine and enjoys the challenges and rewards offered by both specialties. He offers prompt, compassionate care to his patients and is interested in treating all types of pain and the applications of spinal cord stimulation.